The film is an adaptation of a story in Chinese mythology (in particular, the epic fantasy novel Fengshen Bang) about the warrior deity Nezha. After a gestation period of 3.5 years, Lady Yin, the wife of General Li Jing, gives birth to a flesh ball, which becomes a lotus flower, from which Nezha is born. Nezha is born able to walk and talk, and is taken on as a student of the immortal Taiyi Zhenren. The Dragon Kings of the Four Seas, tired of being peaceful, have become cruel and destructive, plaguing China with destructive storms and a drought. The people beg for rain, but the East Sea Dragon King Ao Guang ignores them, telling the yaksha Ye Sha to go and find children for him to eat. Ye Sha captures one of Nezha's friends as he is bathing by the ocean, and Nezha confronts him, injuring him badly. Ao Guang sends his third son, Ao Bing, next. Ao Bing is killed by Nezha, infuriating Ao Guang. A variety of confrontations ensue between Nezha and Ao Guang. 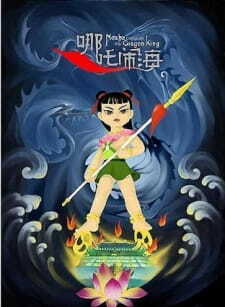 Ao Guang and the other Dragon Kings wreak havoc on the people, causing storms, floods and all manners of natural disasters. Seeing this, Nezha takes his father's sword, tells his parents that he is returning their flesh and bones to them, and calls out for his master before committing suicide by slitting his throat. He is reborn with the help of his master, again from a lotus blossom, and is given new weapons and abilities. After breaking into Ao Guang's underwater palace, he confronts Ao Guang and the other Dragon Kings again, and is finally triumphant.